Phenergan contains the active ingredient promethazine. It is an antihistamine, a medicine that blocks the effects of allergic reactions. Allergies are caused by histamine, a substance that occurs naturally in the body which activates our immune system. Phenergan slows down the production of this substance, reducing allergy symptoms such as skin rash (nettle rash), itching, sneezing, nasal congestion and redness of the eyes. Phenergan is prescribed to treat various allergies, including house mite allergy, allergies for pets and hay fever. Because Phenergan also blocks receptors in an area of the brain called the vomiting centre, it is occasionally used to treat motion sickness or (pregnancy) nausea and vomiting. Phenergan is available in tablet and syrup form. The tablets should be swallowed whole with a drink of water. A dosage beaker is included in the package for measuring the correct amount of syrup. Phenergan may be taken with or after meals. Phenergan is recommended 30 to 60 minutes prior to departure if used for motion sickness. The duration of the treatment is determined by the doctor. 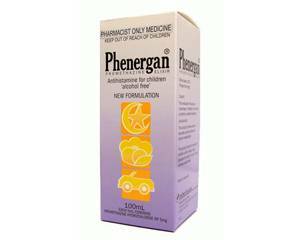 Phenergan is not suitable for use by small children and infants. Doctors may prescribe an alternative dose of Phenergan in syrup form for children aged two and older. See the package leaflet for more side effects, warnings and contraindications. During pregnancy, Phenergan should be used only in consultation with a doctor. Do not take Phenergan if you are breastfeeding or during the last six months of pregnancy as it may harm the unborn baby. Phenergan affects your ability to react. Do not participate in traffic if you experience drowsiness, sleepiness or dizziness. Alcohol may intensify side effects such as dizziness. It is important that you are aware of this and stop or reduce your alcohol intake.